Congratulations on your 34th anniversary – God is so good! Your new book, Don’t Miss HEAVEN is very good and carries a most timely message. Your new book is wonderful! I can’t imagine a person that is not saved, reading this book and not accepting Christ as their Savior. This book is magical. It made me feel so good and I already know this stuff. Send me a bunch of your books. I am going to take them to the detention center here in Las Vegas. I made a donation on your website to cover the cost of the books. God Bless you! Your new book was breathtaking…even my daughter told me she wanted to read it when I was finished. The new book about HEAVEN is so rich and so true. You hit a home run with this one. There is no way the most simple person on earth could not understand it. I gave a copy to a co-worker. When he is finished reading it, I’ll be reading it again. I read the book about HEAVEN and it is absolutely great! My wife and I take both of our hats off to you on the most recent book about HEAVEN. Send us a reasonable number (50-100) so we can get out on the mission field here in our neighborhood. This is a soul-winning book in the hands of any believer. You didn’t leave a stone unturned with this one. The first page and half even got me checking up on my own salvation! God bless you all. This is Wayne. This book on HEAVEN is going places…get me 50 copies ASAP! This is a very timely word for the church that’s playing church! Print some more quick-because the Lord is showing me many people who need to read this book. Keep winning the lost to Christ. I’m sending you a $1,000 check to get us some more copies of your book on HEAVEN. This book is a winner in any language! Don’t change a thing about it-just print it. Thank you for obeying God on this one. Arlene and I are convinced that God is all over this book. Put us down for 100 copies as soon as you can. We can go into the ministry with this book! Your book on HEAVEN will touch a multitude of people. I salute you brother because this book is a masterpiece! Your husband Bill has exceeded all of our expectation with the book about HEAVEN! I know there are many people who will make decisions for Christ through the pages of this book. We want to help you with future printings. Please find enclosed our check for $250. God bless you. Sandy and I have just finished reading your book on HEAVEN. What a great blessing! There is not a person on earth that would not be blessed by this wonder message. We believe this book will impact many, many lives for the Kingdom of God until Jesus comes for His Bride! Thank you for allowing us to have a small part in the printing of it. We love and appreciate you and your work in the prisons! You invited us to share a few words about your new book, “Don’t Miss HEAVEN.” All I would have you know is the anointing of the Holy Spirit is all over it! I can’t add much to that. God has gifted you with the ability to put His thoughts on paper. Every book you’ve written has been given an assignment from Heaven for people. This book made me feel good about where I’m going to spend eternity. I believe “Don’t Miss HEAVEN” will move many a heart closer to the Lord and the Salvation He has provided is Son Jesus! Keep going – you’re headed in the right direction. Thirty-four years, 390,000 souls, and now: “Don’t Miss HEAVEN” well done my friend. What are you going to do to top all of this? I can’t wait to see what plans God has for you next. It’s exciting supporting you every month just to see what you’re going to do now. God bless for you and ALL you are doing for the kingdom. Your new book is so powerful. This was surely a Word from the Lord! Run with it! Your ministry touched my son when no one else could. He is a changed man because you were willing to write and share your heart with him. Nothing could ever repay you for what you have done for my family. This new book deserves much attention by many a weary soul. I was in town the day your newsletter arrived and I told Mia, I want to help print additional copies of this book for other parent’s children who are behind bars. Let Me know what a thousand copies would run. Thank you and God bless you. I was so moved by your latest book on Heaven. What an amazing word from God for the printed age. This book is going to wake up the church and bring the lost to a saving knowledge of Christ on both sides of the bars. My name is Bill B. and I have been actively engaged in MAPM prison ministries for nearly 30 years now. This has been a hugely rewarding experience for myself and the hundreds of thousands of prisoners who have accepted Jesus Christ as Lord and Savior through the outreach of MAPM. I would briefly like to share three stories of MAPM’s outreach which I personally witnessed. First – In Southeastern Oklahoma we had a two day crusade in the local State Prison. During preparations for this crusade, within the prisons walls, the Holy Spirit fell upon the MAPM team and created an unbelievable environment of love and peace within the chapel. We had multiple services with hundreds of inmates accepting Christ. No one wanted to leave the services as the Holy Spirit ministered so intimately to the prisoners. Second – In a state prison in north central Oklahoma, MAPM was having the last service of the crusade when one of our team members suggested to brother Street that we should finish with a prayer service for the inmates. Brother Street agreed and God gave us a prayer service for the ages. Even the very toughest prisoners came forward that afternoon crying out to the Lord for forgiveness and healing. Each prisoner shared with everyone in attendance the very deepest desires of his heart. Everyone joined in agreement with the prisoner’s request of the Lord. It was truly a miraculous time with needs being met as gifts of the Spirit were truly in operation. There was not a dry eye as the Holy Spirit moved so graciously. Third – Many years ago, brother Street sent a copy of his testimony book, “A Voice Behind Bars”, to a prison in New York. An inmate read the book and accepted Jesus as Savior and Lord. He then proceeded to share the testimony book with his pod and each one in the pod accepted Christ. As the prisoners communicated with their families, each family member gave his/her heart to Christ. Soon afterward, brother Street received in the mail a cloth sheet with each name personally handwritten on it. The total names on the cloth totaled 114. What a treasure to lay at the feet of Christ. If you, like me, want to sow seed into the really fertile soil, may I recommend MAPM? This soil produces fruit in abundance and continues to multiply over and over again. What a blessing you are to the body of Christ and to all those who you come in contact with! The Spirit of the living God that lives inside of you beams light into the darkness when you enter the room. Your years of selfless work in bringing others to the knowledge of the truth and salvation found in Jesus has been and is a testament of your faith. My father and mother loved you dearly and enjoyed your presence, and together, you strived to open blind eyes for others to see the truth of the gospel, a salvation of the soul that is only found by accepting Jesus into your heart. During our lives we encounter people who influence us in both positive and negative ways. Of course the positive lifts and builds us and the negative tear us down. We need people who can direct us to Christ because without him we have no hope. Things are going to come against us in our lives that we cannot handle ourselves. “WE NEED HELP”. A lot of people desire to help others, but they do not have the knowledge of God and how He works to be able to help. Very few people have the knowledge and understanding of God’s Word to point us in the direction we need. I have never met anyone in my life like Pastor Bill Street, Jr. He has the ability to help one who is facing a life or death situation. He does not preach vain words of wisdom but teaches the Word so we can be made whole in Christ both spiritually and physically. I have come to love and appreciate Pastor Bill and Margaret in a great way in the short time I have known them. They have been a blessing to my family. I am expecting even greater things in the future under their ministry. There are people who talk the talk but sure don’t walk the walk. We’ve known Bill ever since Senator John would take Bill with him (this was before Bill’s prison release). Afterward, we met Margaret and then realized she was the anchor behind the throne. The unity of a man and wife has great power and authority in the Kingdom of God and is noticed in the effectiveness of any ministry and definitely in Mid-America Prison Ministries. It is a great privilege to know them and their family. Your home is a true reflection of a God orientated family. I have had the privilege of traveling with Bill to many prisons and have seen his effectiveness both as a Bible teacher and evangelist. I have watched him grow and mature in the Lord. To me, he is a living testimony of what God can do in the life of a prison inmate. Mid-America Prison Ministries is truly a ministry ordained by God and is having a great impact on the lives of prisoners all across America. I have known Bill many years and I am pleased to serve as a member of the Ministry’s Board of Advisors. MAPM has been able to reach inmates in a personal way through books and literature sent from the ministry. That is what makes the ministry so unique. The ministry is reaching those behind bars with printed material sent to them. With faith filled material and the power of the Holy Spirit, men and women are coming to know Jesus Christ as their personal Savior. Thank you for giving us the opportunity to share a few words about our partnership with MAPM: What an anointed couple and anointed prison ministry. Your work these 31 years has touched the heart of God. Thank you for being so faithful God’s calling and allowing us to be a small part of this wonderful ministry. We love you! I am so elated over your 31st anniversary and the 365,000th decision card for Christ. That’s why were partners of your ministry. It’s a blessing being a part of God’s ministry behind bars. Keep it up! Jennifer and I are proud to be a part of Mid-America Prison Ministries. When we heard you speak in Savanna, Georgia our minds were set on helping you. That’s been 19 years. Thank you for your work in the prisons of America. The night you were on Richard Roberts program, SOMETHING GOOD TONIGHT, THE HOUR OF HEALING, God spoke to our hearts to help you keep reaching the lost behind bars. There’s not another harvest field in this country as ripe as that one. We’re behind you 100 percent. 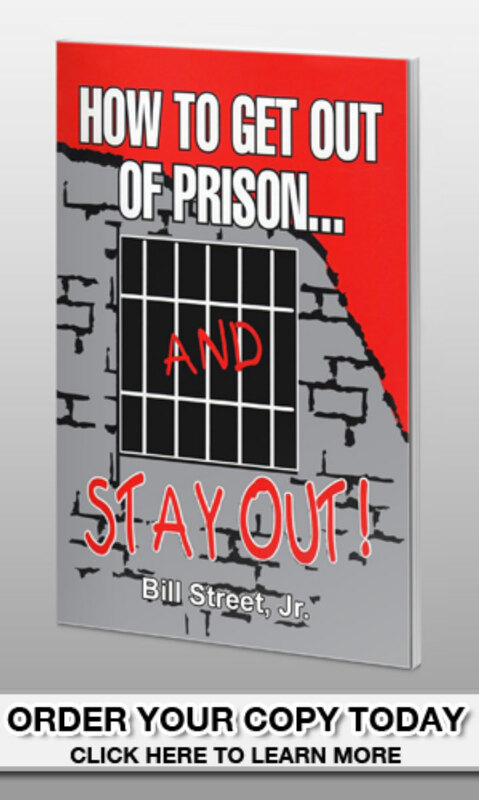 This testimony is for all the moms and dads out there who have a son or daughter in prison- Order Bill’s book, “HOW TO GET OUT OF PRISON… AND STAY OUT!” It will change their life. The ministry you provided to our son in prison was life altering. Don’t ever quit doing what you’re doing. We are so grateful to have attended one of your services 21 years ago in Corpus Christie, Texas. We were so touched by your message. We feel blessed to be a part of something so fruitful as MAPM. Keep pressing in and God will give you the 1,000,000 souls. Thank you for your cards and caring ways. We’re glad to be partners of your prison ministry. You and Margaret have been so faithful to your calling behind bars. God has blessed and increased the work of your hands. Thank God for the abundant harvest of souls over these 31 years. We rejoice that we can be a part of your ministry. For almost thirty years now, both of you have been there for us, inspiring us, teaching us through example, helping pull us through the difficult times and providing opportunity where we can serve our Lord and Savior. Greater love has no man than this: that he lay down his life for his friends. We have taken comfort in knowing you take our needs to the Heavenly Father. Thank you for reaching out to everyone and for being such an example of what a disciple of Christ should be like. We have been a part of the life-giving ministry of MAPM since the late ’80s. What a blessing to partner with and see God move mightily through MAPM to reach men and women in America’s prisons. We love Bill and Margaret…as they are the “real deal” when it comes to caring for and loving those in captivity. We look forward each month to the updates of what God has been doing through the MAPM team to set people free. Have you ever wondered if the finances you give to a ministry are spent efficiently? Every month the ministry sends out reports from inmates whose lives are changed by Mid America Prison Ministries. The stories related by these inmates and the changes that Jesus Christ has made in their lives will remove any doubts about this ministry. You will be blessed as we have been by the reports from behind bars.